This month’s spotlight shines on Christina Caraballo (@Christina_HIT), co-founder and COO at Kizmet Health, and host of the next #healthITchicks tweet chat on Wednesday, September 19 at 1pm ET. What prompted you to enter – and stay in – the health IT field? I’ve always known I wanted to be in a health-related field, but health IT was not always on my radar. When I was working on my MBA with a focus on Health Management Leadership and Services, I enrolled in a health IT class because it fit my life schedule. To my surprise, I had that aha moment when I knew this was it. Suddenly, I saw health IT as a way to solve some of healthcare’s greatest challenges and make a tremendous impact on the way our healthcare delivery system works. As someone who is always up for a new adventure, I jumped in with both feet and soon immersed myself in the health IT arena. Fortunately, this was during a time when the industry saw the value in the investment of educating their workforce, and I was able to pursue an ONC-funded Graduate Degree in Health Information Technology. How has your work in the field helped to improve patient care? The world is in the midst of a massive transformation that seeks to improve health and healthcare by looking at how policy levers, innovation, consumer engagement, access to information and the adoption of health IT can help us achieve better health outcomes while streamlining spending to make it more effective. While there is a tremendous amount of excitement at tech conferences and amazing work being done at some the most innovative healthcare organizations, there are still major gaps in utilization and adoption, especially when it comes to the neediest populations. I see myself as an advocate who sees power in leveraging technology as a tool to fundamentally change the way we approach healthcare and unlock future models that will improve lives around the world. I have been very active in challenging the way the industry thinks about healthcare as we undergo this cultural shift by participating in various work groups, committees, and advisory boards. I envision a world where healthcare is no longer centralized around the hospital, but where we live, eat, work and play. A world where technology enables us to truly incorporate social determinants of health to create a healthcare system that targets the right patients at the right time, and care is received when and where it is needed most. I personally love health IT policy because I believe it has the power to make the greatest impact on a large scale to improve people’s lives. With a DC hat on, I think it is important to always remember that it is the people on the ground who can make the most change happen in their organizations and communities. As a member of the Health IT Advisory Committee (HITAC), I strive to be a strong voice for patients, consumer technologies and laying the foundation for an ecosystem where all stakeholders can thrive. As a co-chair for the US Core Data for Interoperability Task Force, I had the honor of working with a group of industry thought leaders to provide recommendations to the National Coordinator for Health IT. Currently, I am collaborating with my colleagues to guide the industry to achieve interoperability and robust patient access to health information. I am committed to the advancement of health IT globally. As a member of the Maryland-DC District Export Council (DEC), I am able to provide a voice for the sector’s unique challenges and opportunities so that the Department of Commerce can better assist companies to expand locally, nationally, and globally. What health IT development/product has you excited about its potential to improve care access/quality/cost, etc.? I’m excited about Congress’ bipartisan commitment to interoperability and patient access to information. I know the promise of the Trusted Exchange Framework and Common Agreement (TEFCA) is going to have its challenges, but I think we can achieve our goals by working with all industry stakeholders to achieve interoperability and provide meaningful access to health information. I am not one to shy away from the “impossible” or be naïeve about what is attainable, and I truly believe we have the building blocks and are on the cusp of supporting a robust ecosystem of patient-centered care. I’m looking forward to working with others to achieve our goals. 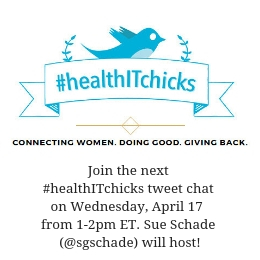 The #healthITchicks community believes strongly in doing good and giving back. What are your favorite ways to give back, personally and/or professionally? I am a strong believer in the power of community and playing an active role in driving positive change in everything that I do. I love inserting myself in the middle of conversations to listen, learn and collaborate with others to make the greatest impact. This is why I dedicate time volunteering. I am an active member of HIMSS, where I serve on and lead various committees, work groups and conference planning committees focusing on topics ranging from policy, standards, interoperability, health information exchange, consumer engagement, and connected health. At the local level, I love working with our newest and brightest minds by serving as a mentor for the HIMSS National Capitol Area chapter, and I’m in the process of working with some amazing #heatlhITchicks to develop a chapter focused on women’s initiatives. Stay tuned! On a personal level, I am an ambassador for American Parkour (APK) which is a fitness community dedicated to promoting health, wellness and community through play and movement. As an APK ambassador, I help organize monthly free women’s Parkour meet ups to encourage women of all shapes and sizes to move their bodies and have fun. I also help with planning, marketing and executing community events. When it comes to personal and professional development, who or what has had the biggest impact on yours? Mentors. So many of them! I have been lucky to have a myriad of amazing people in my life who consistently believe in me. If I were to pinpoint one organization that has helped me grow, HIMSS stands out as a catalyst for my entry into the health IT world. Working for a small tech vendor as the designated policy expert and liaison to the health IT industry, I lacked co-workers who were in the trenches with me. So, I started attending as many events as possible and talking to as many people as I could. I joined my local HIMSS chapter and became a regular face in the crowd. The HIMSS community as a whole and the amazing HIMSS staff played a significant role in my ability to navigate this industry. They pushed me to delve into the intricacies of policy, not just the surface. I remain an active member of the community to give back while also continuing to lead and grow both personally and professionally. In terms of career advice for younger colleagues, what do you wish you had known then that you know now? One of the first things that I say to my mentees is that I am a resource to help them grow and here to try to provide a safe sounding board to explore and brainstorm ideas, but my story is unique to me. Mentors can offer advice from their experience and path, but only you can determine what direction you want to take. Surround yourself with people who inspire you and who you admire and learn from them. If I could give my younger self one piece of advice, it would be to trust your heart. A lot of my mentors likely got frustrated with me because I didn’t really have a plan. I have always had a lot of things I care about and find interesting, and my goal has always been to simply make the world a better place. I believe that this can be achieved from the simplest forms of kindness such as making another person’s day better to helping in your local community to global initiatives that help the masses. This way of thinking led me to seeing the possibilities surrounding health IT and navigating an industry that is rapidly changing and entering unchartered waters. I encourage others (and remind myself) that to change the way people think about healthcare often requires us to become comfortable outside of our comfort zone. To make a positive change, it is important to have a voice and not be scared to use it to inspire others. What are you looking forward to chatting about during the #healthITchicks tweet chat on September 19? ONC’s latest undertaking to achieve nationwide interoperability is the Trusted Exchange Framework and Common Agreement (TEFCA). What are the biggest challenges and opportunities facing #TEFCA? The newest and coolest “encyclopedia for standards” is the Interoperability Standards Advisory. It is an interactive and evolving tool for the industry. How is your organization using #ISA? How could it be more valuable? As we move towards value-based care, what stakeholder groups and/or initiatives will be most impactful? How are they changing the healthcare landscape? What’s next? #HIMSS Annual Conference creates an invigorating environment for #WomenInHIT to mix, mingle and learn. How can we keep the momentum going throughout the year? What are you doing locally? How has the #WomenInHIT community helped you to grow personally and/or professionally at all stages of your career? Just for fun: What is your favorite vacation getaway spot/place to travel to? Join Christina Caraballo (@Christina_HIT) on Wednesday, September 19 at 1pm ET for the next #healthITchicks tweet chat. You can also connect with the community on LinkedIn via the #healthITchicks group.